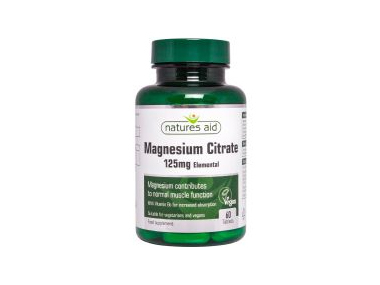 Buy Natures Aid ® Magnesium Citrate 125mg with B6 in the UK from our online shop or directly from our independent Scottish store. Magnesium contributes to normal muscle function. With Vitamin B6 for increased absorption. Natures Aid® Magnesium and Vitamin B6 both contribute to normal muscle function and the normal functioning of the nervous system. Where can you buy real Magnesium Citrate 125mg safely online? If you are wondering where you can buy Natures Aid ® Magnesium Citrate 125mg with B6 safely online in the UK, then shop with us. Magnesium Citrate 125mg - Natures Aid ® Magnesium Citrate 125mg with B6 in Minerals A - Z and Vitamins and Minerals.